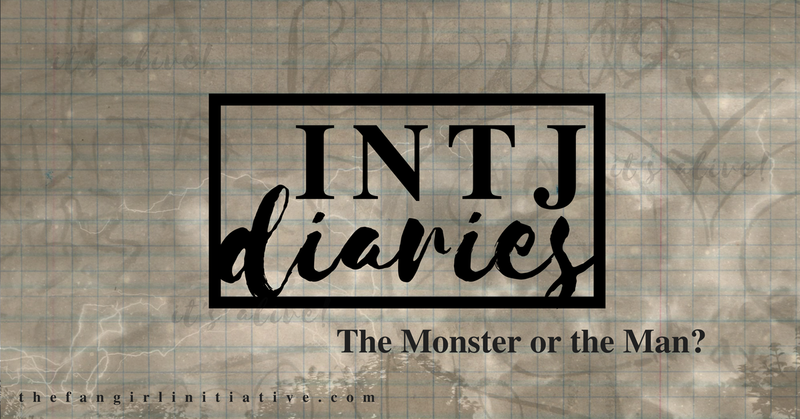 INTJ Diaries: The Monster or the Man? I have done something very stupid. Very, very stupid. It's a well-known fact that INTJs don't make mistakes very well. It's not that we don't make mistakes, even though that's what we'd like you to believe, it's that we don't make them well. When we screw up, we tend to screw up big. No half-assing things for us. And then, we try to fix it. And if we can't fix it, we ignore it and hope it goes away. We're not proud of this. Victor Frankenstein is, without a doubt, an INTJ. An insatiable curiosity paired with vehement passions toward learning and a love of solitude. "It was my temper," he says, "to avoid a crowd, and to attach myself fervently to a few." (26) A one-track mind and penchant for seeking vengeance. A desire not just for knowledge, but for things unknown by mortal man. "It was the secrets of heaven and earth that I desired to learn," he says. (27) INTJ. He spends his childhood reading ancient philosophers and scientists, disregarding the warnings of anyone else that the men he is studying have no basis in fact because the naysayers don't understand the books the way he does. He goes to university and behaves much the same way, dedicating himself to science and to the service of professors he finds thinking along the same wavelengths that he is, accomplishing great things in a short amount of time. The last group, however, is usually the one that spurs us onto things. We learn most of what we know while trying to prove people wrong, and as a result, we know a lot. And we're good at proving people wrong. But sometimes it's random happenstance that will spur us on the most. An overheard snippet of conversation, a perfectly placed scene. When Victor stumbles into a lecture, his life is changed forever, pulling together all the pieces he's spent his entire life cultivating. INTJs don't think small. I don't think we're capable of it. We tend to have "all or nothing" approaches to everything we do. "Go big or go home" is our life's motto, though we don't actually believe in the going home part. And once we're set on a track, almost nothing will remove us from it. And so starts the downhill spiral of Victor Frankenstein's mental state. He vows to himself to unfold the deepest mysteries of creation, and so he does it. INTJs don't believe in the word "impossible," and when we set out to do something, we'll do it. One way or another. Often this results in the deterioration of our social lives, our tempers, and even our health. It's not that we don't recognize what's happening: we do. We just don't care. We become so absorbed in our work that nothing else really matters. Bodies heal. People come and go. But this, whatever we're working on, this is the end all be all of our existence. If we don't succeed, we fail. If we quit, we fail. If we don't finish, we fail. The only way out is complete success. Or death. And so, of course, Victor succeeds in creating an animate being. But, when he has finally succeed at his life's work, he looks upon it in horror and disgust. He played God, and it was not good. INTJs, while absorbed in their work, tend to get major tunnel vision. I've already mentioned how nothing but the work matters, but we also don't see anything but the immediate work and it's original long-term goal. Consequences don't matter; we'll deal with them once we're done. If we're truly engrossed, we don't stop to consider the morality of what we're doing or the effect it will have on society or the future... we see only fame and the avoidance of failure. His success is short-lived. He runs from the creature, hides from it. He cannot bring himself to destroy the thing he has spent so long working on, but he hates it. And thus he loses his only chance to fix his problem, to kill the creature, and it becomes stronger than he, living its own story with its own morality. And Victor is left with the weight of what he's done. The guilt that plagues him after the creature commits murder, the horrific thoughts of what the creature might do next, the paranoia that accompanies knowing everything that could happen. But, more than all this, he's left with the notion that even though he was successful, he is a failure. All his work has amounted to nothing but horror for him and everyone near him. In this state the creature finds him and begs a favor. A mate. For Victor to make another like him. He at first vehemently rejects the notion. This one creature was enough. He had succeeded in his experiments and the result had been abhorrent. But the creature makes an argument, and one thing an INTJ can't ignore is a good argument. And so Victor listened to the creature's story. He saw validity in its arguments, he saw the completion—the intelligent completion—of his life's work. And his pride latched onto the only thing it had left: the duty of the creator. Pride is the INTJ's number one downfall. It motivates most of what we do. Often it's pride in ourselves—we think we're pretty cool, after all, and the smartest in any given room—but more often it's pride in our work. We have nothing if we don't have the fullness of success, of recognition, of being better than literally everyone else. But we're also logical, able to see every side of an argument when we're not engrossed in something. That's one of the reasons we become so good at proving people wrong: we're able to anticipate arguments and have already formed a counter argument before the initial argument is out of your mouth. And so with this logic, Victor comes to his senses about making another creature and redirects his pride to himself. "You may render me the most miserable of men," he says, "but you shall never make me base in my own eyes." (127) This statement made me laugh out loud, I have to admit. Victor regrets everything he's done up to this point. He thinks he's the most evil and base of all men. But there's a little part of him that clings to his pride. His first creation was in the name of discovery. He can deal with the consequences because he doesn't believe himself to have done anything wrong. He doesn't regret playing God, he regrets what came of it. So he tells the creature that no, he won't make a mate for it, because to do so against his better judgment, to repeat a mistake, to repeat a ghastly, horrific lapse in planning, would be to become base in his own eyes. INTJs make mistakes, but we don't make them twice. The creature of course, is unhappy with this, and Victor is moved when the creature grovels and appeals to his pride. "Oh! my creator," it says, "make me happy; let me feel gratitude towards you for one benefit!" (128) Moved by sympathy and pride again in his creation, Victor relents. But it's not an easy task. You know how I said INTJs are good at proving people wrong? Well, we can use that power on ourselves, to an extent. Victor doesn't want to go, doesn't want to start on this abhorrent new task set before him. It wasn't something he chose; it isn't something he wants to do. And so he begins to talk himself out of it. The longer he delays, the less necessary it seems. Since INTJs are so able to compartmentalize our minds, if we don't attend to something right away, it loses potency due to other concerns taking its place. Victor puts off starting this task, and nothing happens. Nothing continues to happen. And so life slowly creeps back in and he starts to think that maybe this task that seemed so necessary when it took up the entirety of his mind, might not be that necessary after all. But eventually he begins, and its just as horrible as he thinks it will be. Before he can bring the second creation to life, he has a change of heart. The creature is furious and murders Victor's best friend. Victor moves back home and is brought slightly back to happiness by his impending marriage to Elizabeth. But, since INTJs are forever stuck in our own minds, residing half there and half in the real world, this happiness doesn't last long. INTJs aren't good with feelings. Victor spends the majority of the book overcome with some feeling or another, and we see how well he handles it. Now, of course, is no different, and he goes from rage to despondency with little differentiation. At his lowest of lows, he sits motionless, overwhelmed and confused by all the negative emotions he's experiencing. On top of the failure he felt upon the creation of the first creature, he now has the failures of agreeing to make a second, then going back on his word to make a second, causing more miseries in his life and the lives of those he loves. His life is a wreck—everyone's lives are a wreck—and he knows its his fault. That's not something anyone can handle, let alone someone who starts out life feeling as though he has the weight of the world and all its secrets on his shoulders. The creature kills Elizabeth, as Victor knew it would, and he finally tips into madness and is thrown into an insane asylum. As for any INTJ, madness is not an escape for long, and Victor eventually comes back to his senses and is released. He makes a vow to himself, much like he made a vow all those years ago to uncover the secrets of the universe. He knows this one will kill him, and he doesn't care. He vows to kill the creature, to return the world to the state it was before his pride brought ruin to it. He tells a criminal judge of his plan—ever practical—and is not met with the response he hoped for. INTJs, when they're passionate about something, expect others to be passionate as well. We didn't spend our lives honing our arguing skills for people to meet us with lukewarm sentiments, or worse, patronizing words. So when Victor is met by the judge with soothing words, he cries what might be one of the most INTJ things he says throughout the entire book: "Man, how ignorant art thou in thy pride of wisdom!" (180) Oh, the irony of it. Every single one of Victor's problems came about because of his pride of wisdom. He thought he knew more, thought he could uncover more, thought he could discern the secrets of the universe. And so when this man doesn't believe his tale, doesn't share his passion, he knows what he's seeing and calls it for what it is. One thing INTJs love—and truly, they hate it, but they will do it until the day they die—is lecturing people to not make the same mistakes they did. They won't use those words, though, because to admit a mistake is to admit weakness. And we don't do that. But if we made a mistake, we know all the reasons why someone else shouldn't do it, and we'll make every argument to convince them not to. "Been there, done that" is the most we'll say on that front, and Victor doesn't even go that far. He deems the man unworthy of his time and decides to hunt the creature on his own. He has nothing left for him, and so he will devote everything he has to this one last project. While most INTJs don't create life and end up inadvertently murdering multiple people because of it, we all react roughly the same way. We dedicate ourselves to projects, we run from our mistakes until we've had time to figure out what to do about them, we live in clouds of guilt and misery until everything is taken care of, and sometimes even after. We're not proud of this, but we'd never admit that. If your INTJ makes a mistake, the surest way to become dead to them is to point it out, and especially to point it out to other people. Offer practical ways to help them fix it or distract their mind until they've taken care of the problem. If they won't take care of it, tell them straight up that they're being an idiot and avoiding their problems. They'll be mad, but they'll appreciate the honesty. But the best thing you can do for your INTJ is to take care of them in the throes of a project. I guarantee they'll forget to take care of themselves, so feed them and remind them to sleep and take a shower. But don't nag them. And while you're feeding them, if you see their project taking a turn for the dangerous, tell them. They'll love you for it, even if it takes a while. All quotes taken from Frankenstein by Mary Shelley, Collins Classics Edition, 2016.